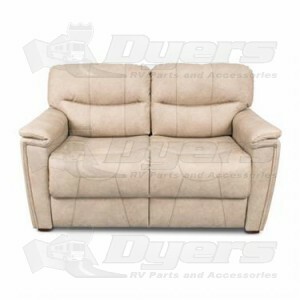 Not only will you enjoy the comfort of the Thomas Payne Tri-fold RV Sofa, but you will also love the style and elegance the rich Grantland Doeskin PolyHyde™ upholstery and modern contrasting stitching brings to your RV. The Tri-Fold Sofa is also low maintenance and easy to clean, perfect for those traveling with pets and kids! Have had our couch about 3 weeks now and it is very well made. Bed is very solid and design is good, but surface is uneven with the back section lower than the front. Don't know how the design could be changed. Other than that, we are very pleased with our purchase.